Abstract: Parkinson disease, a neurodegenerative disease, is commonly increased in elderly people and becoming a big challenge for anesthesia. There are approximately 60,000 American people diagnosed with PD each year1. The majority of people have diseases at the age of 50 years or later. Parkinson Disease (PD) is a type of neurodegenerative disorder of the loss of dopaminergic neurons in subtantia nigra. It has been the hallmark of Parkinson’s disease for over 300 years and yet there are no causes and cures found. However, there are many etiologic factors, such as: organophosphate exposure, dietary factors, and lifestyle factors. The epidemiology is associated with increased aging, tremendously decreasing motor neurons; therefore, it causes rigidity, resting tremor, and involuntary movement. Ecstasy is also known for the disruption of the transportation for neurotransmitter such as dopamine and serotonin. In fact, there are many clinical manifestations to optimize the neurological conditions and physiological changes in the preoperative, intraoperative, and postoperative parameter. Particularly, the considerations of pharmacological agents are administered in anesthesia management in stereotactic pallidotomy and deep brain stimulation. 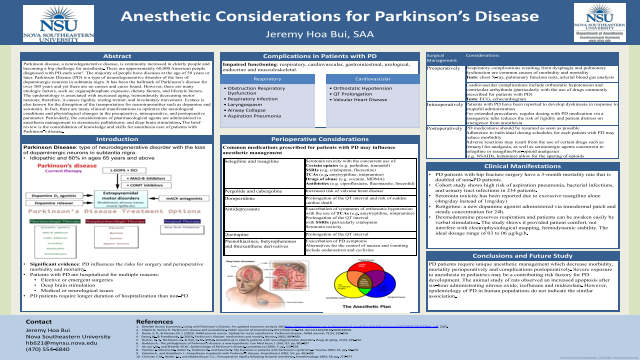 The brief review is the consolidation of knowledge and skills for anesthesia care of patients with Parkinson’s disease. Summary: PD patients require unique anesthetic management which decrease morbidity, mortality perioperatively and complications postoperatively.